I’ve seen—on the news, because I certainly wouldn’t know from experience—that Polynesian Tiki bars are becoming “hip” again in places where hip people congregate. “Again” because they used to be popular in the 1950s, well before I would have been able to go into one. Dried grass above the bar. Fruity drinks in fancy glasses with little umbrellas stuck into them. And, of course, Hawaiian music, preferably with a little combo, but at least on the jukebox, played on a lap steel guitar like this Harmony Roy Smeck. Hawaiian music actually had an extraordinary run of popularity in America that predates even me. Hawaii has been important for the U.S. since the mid-19th Century. Situated halfway between the Americas and Asia, it was a natural stopping point for sailing ships. Guitars and banjos were common possessions of sailors, so some of each ended up on the Islands. (Any musician in the crew of a ship captured by pirates was automatically spared and recruited into the pirate crew.) Both guitars and banjos figured in Commodore Perry’s opening up of trade with Japan in 1854, when sealing the deal included several blackface minstrel shows…and lots of champagne. Minstrelsy and Kabuki theater have more than a little in common, after all! Hawaiians quickly developed open tunings (“slack key”) and playing with a slide, probably by around 1880, give or take. Hawaiian musicians had come to the U.S. mainland by late in the 19th century and figured prominently in a number of World’s Fairs, where Americans were often regaled by various “ethnic” exhibits on the surrounding midways. There was a Hawaiian show at Chicago’s Columbian Exposition in 1893. By around 1910 Hawaiian music was big on Broadway and with college students (Boola-Boola was originally the Hoola Boola). It was probably—at least in part—the rage for Hawaiian music following the 1915 Panama Pacific International Exposition in San Francisco that inspired Sears to purchase the Harmony Company in 1916 and introduce a number of Harmony-made Hawaiian instruments the following year. And, don’t forget, it was Hawaiian music that led directly to the first successful electric guitars in 1931-32. 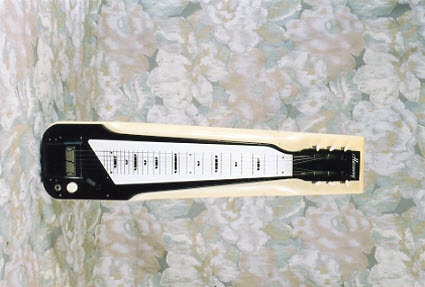 Including association with this late example Harmony Roy Smeck H7 Lap Steel that dates to about 1968. 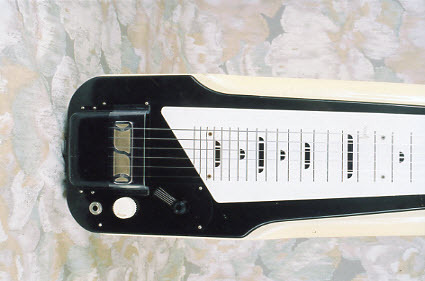 This modern take on the lap steel was originally introduced in 1955 and sported Roy Smeck’s name on the handrest. In around 1958 these came with optional legs, which this example has. At some point in the 1960s Smeck was still the endorser in the catalog, but his name had been removed from the guitar. Like many lap steels, this is pretty basic, with one single-coil pickup and volume (black) and tone (white) controls. 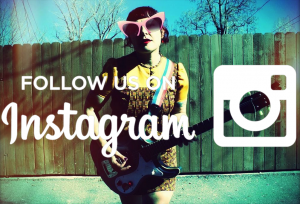 Still, it’s quite serviceable for playing Yellow Bird or Aloha-Oe on your next gig at the neighborhood Tiki bar and I’ve always preferred legs to holding a guitar in my lap. There can’t have been many of these Smeck lap steels made in 1968. Hawaiian music had become mighty passé in the face of the onslaught of The White Album and Jimi Hendrix, although nascent Country Rock was just beginning to emerge, but with pedal rather than Hawaiian lap steels! (I recall there was a Tiki bar in Toledo into the 1970s, but it was something of a dive by then and you were more likely to hear Dolly Parton than Jerry Byrd on the juke.) 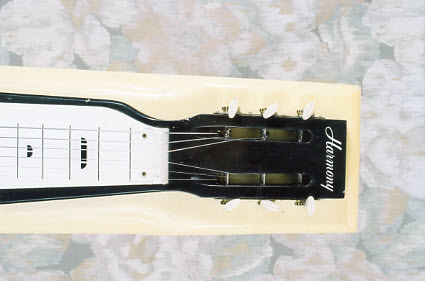 The H7 became the H607 in 1972 in the catalog, but Harmony’s lap steels would bite the dust the following year. 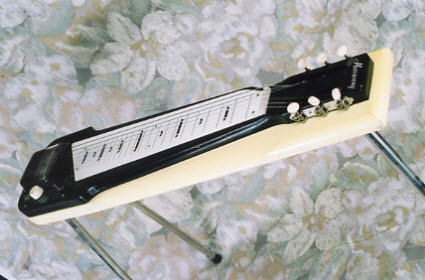 There remains a small group of devotees of the Hawaiian lap steel. Since I’ve never been accused of being hip (the only hip I know about is the new one I recently got! ), I haven’t much followed the Tiki bar revival. (Don’t care much for fruity drinks with umbrellas either.) 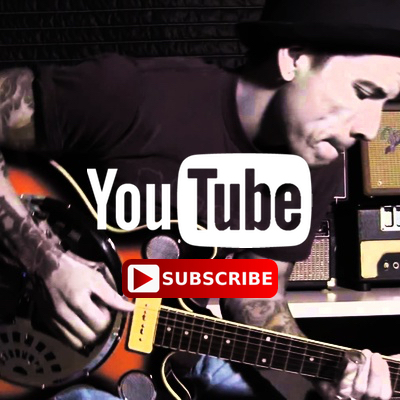 There may be a concomitant resurgence of Hawaiian music and the lap steel, for all I know. But I doubt it. Still, the ukulele hasn’t done badly over the last few years, so maybe it’s time has come!